Abstract: This article will, from the point of view of cultural theory, discuss the polarization that is frequently found between playful learning at the kindergarten and serious learning at school. Planning of the time in the German-speaking Swiss kindergarten is strongly influenced by the portent of preparation for school, which is combined with a reputedly vital transition from free playtime to planned curriculum-oriented learning time within a specific school order, additionally driven by a discourse on time pressure. The question is asked whether this is primarily a matter of “gaining time” for education, or whether it is about familiarizing the children with primary school culture as such. The question is asked: What potential for school-learning processes could possibly lie in play? Both cultures, that of the kindergarten as well as that of the primary school, are viewed as performance practices deeply rooted in historical, differing symbolic traditions. Abstract (Elke Hildebrandt & Mark Weißhaupt: Ende der Spielzeit? Die Zeit in Kindergarten und Schule aus kulturtheoretischer Perspektive): In diesem Beitrag wird aus kulturtheoretischer Perspektive die oftmals vorgenommene Polarisierung zwischen spielerischem Lernen im Kindergarten sowie ernstem Lernen in der Schule diskutiert. Die Zeit im deutsch-schweizerischen Kindergarten wird stark unter dem Vorzeichen der Vorbereitung auf die Schule geplant, die mit einem vermeintlich notwendigen Übergang von freier Spielzeit auf nach Planung verlaufende curriculare Lernzeit in einer spezifischen schulischen Ordnung einhergeht. Es wird die Frage diskutiert, ob es dabei primär um „Zeitgewinn“ für Bildung geht, oder um eine Gewöhnung der Kinder an die Kultur der Schule. Es wird gefragt, welches Potential für schulische Lernprozesse im Spiel läge. Der Unterricht und die Diskurse im Bereich des Kindergartens und der Primarschule werden als Aufführungspraxen zweier unterschiedlicher, historisch gewachsener Schulkulturen perspektiviert. Pезюме (Эльке Хильдебрандт и Марк Вейсхаупт: Конец времени игры? Время в детском саду и школе с точки зрения культурно-теоретической перспективы): В данной статье рассматривается с точки зрения культурно-теоретической перспективы часто совершаемая поляризация между игровым обучением в детском саду и серьезным обучением в школе. Время в немецко-швейцарском детском саду имеет сильное планирование под знаком подготовки к школе, которая сопровождается предполагаемо необходимым переходом от свободного игрового времени ко времени обучения, протекающего по плану, со специфическим школьным порядком. Рассматривается вопрос, идет ли при этом речь первоначально о «получении времени» для образования или о привыкании детей к культуре школы. Ставится вопрос, какой потенциал для школьного процесса заключается в игре. Обучение и дискурсы в области детского сада и начальной школы рассматриваются как вводные практики двух различных, исторически выросших школьных культур. “Playful learning” is often opposed to “serious learning” in school – a polarization that is deeply rooted in everyday language and that has characterized the cultures of kindergarten and school (Hildebrandt & Weißhaupt, 2012; Hildebrandt, Nieswandt, Radtke, Schneider & Wildt, 2014). As portrayed by Helsper, this represents an understanding of culture “in whose context the school culture is understood to be a symbolic order, a sensitive complex of values, norms, rules and expectations within the tense balance of the tangible, the symbolic and the imaginary” (Helsper 2008, 36, himself using Lacanian concepts). With regard to the kindergarten, we use this definition of Helsper, too, because in kindergarten the symbolic order, the interaction of the real and the imaginary within it, discourses, artifacts, role expectations and values also pertain to it (the teaching practitioners themselves do not use the term school culture, even if the kindergarten in Switzerland is part of the school, since the two institutions are structured by different school culture traditions). In this article the situation of these school cultures, especially within German-speaking Switzerland, is considered, although there are also general tendencies of a globalization of education (among other things through international tests) and common historical roots of some school cultures that also pertain to this discussion (ibid., Proske, 2009). Our observations, presented both as a contribution to the debate and a theoretical paper, will, during the course of the following discussion, argue in a deliberately typifying manner, so as to be able to clearly illuminate the dynamics of the two school cultures in question, proceeding from the kindergarten and the primary school in German-speaking Switzerland, and will also use some instruments that a culturalist perspective on school culture offers. Through this culturalist perspective, we are able to analyze certain dynamics, but also a certain persistency, some partially unconscious traditions and the discourse shifts in the field of our subject matter, school cultures of primary school and kindergarten, more clearly. One main thesis of this article is that, as a result of certain dynamics, which will be laid out, the school culture in German-speaking Switzerland-Kindergarten is currentlydeveloping in the direction of the traditional primary school culture, especially since in Switzerland the kindergarten forms a part of the primary school. When the time in the kindergarten – in the “pre-school” – is planned now, it is strongly influenced by the portent of preparing for school, since the kindergarten has been allocated to the 1st cycle (kindergarten to 2nd grade primary phase) within the context of the “curriculum 21” (a framing national curriculum in Switzerland). This also implies a perceived essential transition from free playtime to an ordered (curricular) learning time that runs according to plan within a specific school order (Röhner, 2009). This implicitly ambivalent status of play in the curriculum results in, or as a consequence, justifies more sequences in kindergarten that are planned right down to the last detail (Stamm, 2014; Hauser, 2013), intended to get the children “used to” instruction by teachers, instead of following their own curiosity (see also D-EDK, 2014). However, this aim of externalizing motivation should be perceived critically, since the motivation of children in school decreases (Angelone, Keller & Moser, 2013) in proportion to the way in which the alleged “seriousness” of school increases. Is there a real threat of the paradox of over-formalized early support? Instead of the children being motivated for better and earlier learning, could the joy of learning be unintentionally diminished even earlier? How exactly could that happen? There are a number of reasons found at different levels. We will deal with them in five steps during the course of the following discussion. different educational concepts (eg. von Bülow, 2011, 40: “The current educational concept of the developmental phase generally tends to describe education as a construction of the subject. … . However, in contrast, the educational task of the primary school interprets education as a mediation task” (< Citation of German sources are translations by the authors >). The Swiss “curriculum 21” shows that these differences are effective not only at the level of the teachers and the school, but also at the school administration level, as it uses a similar differentiation, when describing the transition between kindergarten and primary school. The rhetoric is that of a gradual change of focus from a “developmental” (Kindergarten) to a “subject-oriented” focus (primary school), which should ensue, according to the “curriculum 21”, within the first cycle (kindergarten to 2nd grade primary phase). But the rhetoric of gradual change within these years is again subverted by the same description – beside the above mentioned teleology of a final end of playful learning –, as, on the one hand, even in kindergarten the themes and objects of any given sequence have, of course, language-specific, mathematical or other subject-specific dimensions (Streit, Künzli & Hildebrandt, 2016) and, on the other hand, after kindergarten or after 2nd grade primary school the development of the children naturally doesn’t stop. Development and school subjects are in fact two different levels of perspective on any teaching situation, not two phases that (however gradually) follow each other. The rhetoric tries to smooth the traditional cultural difference by temporalizing it as slow, but at the same time it reaffirms it in a performative self-contradiction. These elements of school cultures are persistent, irrespective of their appropriateness for the children’s education. Thus, the garden-metaphor continues to adhere to the kindergarten and can be interpreted didactically in different ways. However, it generally implies development, individual growth, a degree of freedom, shelter and tranquility. At the same time it hardly matches current concepts of co-construction and learning in play, education as joint socialization in play-learning-environments, and cognitive apprenticeship through teachers and competent other children (Collins, 1988; Röhner, 2009; Zimpel, 2011; Hauser, 2013). Neither does the garden metaphor fit seamlessly with the idea of child self-education processes (Schäfer, 2011) nor with more instructional concepts of early childhood education (Fthenakis, 2008). As a metaphor, it is part of the kindergarten culture, which reproduces itself in its own logic and to some extent independently from the respective current conflicts in the educational sciences. Similarly, the “seriousness of life”-metaphor adheres to the primary school, as if everything prior to it was just fun, not serious and as if “real” learning, as the opposite of fun, were only now to begin. This metaphor often manifests itself symbolically in rigid timetables and spatial design with fixed arrangements of chairs and tables, as a place of unbending, fixed procedures, that underlie und structure the interaction in school up until today, even if there are already signs of change in various places. Teachers at the kindergarten and the elementary school in Germany perceive it as follows: “The elementary school is regarded by both professions as an institution characterized by its compulsory nature and the pressure to perform, whilst the kindergarten, by comparison, is seen as a ‘play institution with free spaces’ ”(von Bülow, 2011, 233). There is no analogue study in German-speaking Switzerland, but we tend to assume that kindergarten and primary school teachers in Switzerland would argue in a like manner, not least because of some of our own studies that were carried out in kindergarten and primary school (Weißhaupt & Campana, 2016; Hildebrandt, Pautasso & Güvenç, 2016) focussing on play forms in these institutions. While the place of play is still seen generally in kindergarten, in primary school it can often maintain a place only during recess or very short introductory phases. Nevertheless, it seems precisely because of these contrasts that the mental models and metaphors of the kindergarten and the school are preserved – they retain their oppositional form because of the defining and identifiable quality of this oppositional relation. The transition between these two cultures is often seen as a clear split or rupture, which is rather the result of implicit cultural perceptions than of actual pedagogical requirements. Hauser, for example, argues (2013, 136): “… learning through play simply requires too much time. … The wedge of instructive, goal-oriented and compulsory learning – as in school – is driven further and further between ‘playful childhood’ and adult life, the more demanding the latter becomes.” He then correctly states: “It has not been sufficiently clarified when which type of learning is how effective” (ibid.) and thus he queries the position of play from a learning-theory perspective, whereas we are posing questions from a culturalist perspective. As historical forms, the respective school cultures have a self-perpetuating quality. From a culturalist perspective the empirical interaction within these cultures can be seen as two unequal performance practices. Teaching is also done in order to comply with the respective underlying cultural concepts (Breidenstein, 2006). And both the children and the teachers participate: They work within the education system as actors with the available props, roles and scripts that have been distributed before their performance – what choice do they have? The kindergarten culture should not be viewed uncritically, often lacking conscious reasons for their own choice of teaching forms and topics. An example regarding didactic decisions: the choice of themes such as the “penguin” (not seldom erroneously combined with the “polar bear”), an ever-popular figure in kindergarten culture (Imhof & Bigler, n.d.; de Beer, 2012) even though this animal actually features only marginally in children’s primary (non-medial) experience, if they have the opportunity of visiting a zoo. Such themes stay in the imagery of kindergarten culture, but mostly without conscious didactic reflection, whereby the implicit motivation can be seen in the “delightfulness” of the theme, which can lend habitual stability to the teaching scenario, as it brings together the image of innocence (associated in pedagogy with childhood since Rousseau, Thies, 2016), with the image of a certain animal, making it “cute”, quite in contrast with its wild nature. The figure can be described as a condensation, a subconscious bringing together of contradictory images (Jakobson & Halle, 1956/2010), in this case of the contradictory founding motivations and aims of kindergarten culture: a kindergarten figures as a shelter from bad civilization and industrialization, keeping children nearer to nature (following Rousseau), but also has the goal of taming the untamed, unsocial, wild behavior of pre-socialized children. Thus described, the choosing of the penguin is not a conscious didactic decision of individual teachers, it is a non-reflected characteristic of the culture of kindergarten that has emerged historically. Thus, the central focus appears often not to be the suitability for children in the sense of educating them, but rather the non-reflected school culture and the images, roles and ideas of what teaching in the kindergarten should “look like”. The kindergarten culture thus also shows itself to be a self-sustaining form, irrespective of whether some traditions should be consciously re-considered. Another small example that opens the perspective also for primary school: In the German-speaking Swiss kindergarten tradition the “Stübli” session is still most often used, even if it isn’t called that anymore; this is a time where the participants join together and are guided in a circle – named “guided sequence” by Chanson (2004). The children gather in a circle and eventually end the sequence with the communal breakfast, the “Znüni”. During this time the children frequently sing, learn rhymes and participate in certain rituals. As Chanson writes: “In the circle everybody is equal” (2004, 72). Unfortunately, in reality this is also a sequence during which there is a great deal of waiting, when the children cannot initiate activities on their own. The symbolic form of the Stübli circle still fits into the organic imagery of the garden as well as into the progressive pedagogical tradition, but it is also now very suitable to train the secondary virtues, that are seen as important for being “ready” for school: being able to wait, to be quiet. Thus, certain forms can be used in the logic of both school cultures, or in preparation for the “other” culture within its “own” form. In comparison with the school, there is, however, a uniqueness to the kindergarten: The free sequence, or free play is defined by Chanson (2004) as time in which the child is largely allowed to determine his activities himself. “The free sequence” represents autonomous learning in a prepared environment” (Chanson, 2004, 10), where the framework is given through the materials made available by the teacher, the space indoors and outdoors that can be used for play, as well as the playing time and the play-partners (Walter-Laager& Fasseing Heim, 2002). Nevertheless, it needs to be investigated in individual cases to what extent the autonomy of the children is actually possible with regard to the choice of their play activities, goals, space and partners, particularly when taking the real pressure and implementation of primary school teaching elements in kindergarten in the last years into consideration. In German-speaking Switzerland the kindergarten culture traditionally refers to the precious asset of free play, an environment in which the child is protected from the adult world, and with which one should not interfere without being asked to do so (Fröbel, 2017; Association of Swiss Kindergarten-Teachers, 1990), quite in line with the idea of the shelter from bad civilization. The priority of autonomy per se over play-support by the teacher can, however, actually be to the detriment of children who may, for whatever reason, have difficulties in playing (De Haan et al., 2013). On the other hand, from a culture-theoretical point of view, it becomes clearer in primary school that the children do not only direct their learning, and perhaps not primarily at all, towards the development of their skills, but rather towards the implicit goals of school culture: Children, don’t show us their “readiness to learn” but rather their “school readiness” (in the sense of readiness to act according to their preset role in school)! The implicit behavioral stage directives are soon understood by the children: I show that I can sit still for a long time. I can do my tasks without talking to someone about them. I can listen to the teacher and show signs of paying attention, irrespective of whether I understand or can make associations. I show that I can subdue my impulse to find something out by working and communicating with someone else. I can ignore my primary interest and my curiosity and turn to those things that I have to do at the moment in accordance with the timetable (Breidenstein, 2006; Jäger, Biffi & Halfhide, 2006; Jäger, 2007; Röhner, 2009). Officially, no one would speak out in favour of the priority of integration into the school interaction order as opposed to education. However, in particular the secondary disciplinary virtues that are part of this school performance are those that are often the first and most important in the eyes of new teachers in the primary phase. That primary preference, once having “successfully” structured their teaching, then remains as a standard habitual preference. They sense that the appearance of that which seems to be “normal” (traditional) class teaching is what the school culture primarily expects them to achieve. Am I in control of my class? Does my class look like “a class that is functioning well”? And that means: Do they appear quiet, concentrated and organized? Do they respond to my instructions and do they give the impression of being ready “to be taught upon”, of teachability? The appearance of an orderly class can thus become a goal in itself, more important than the educational interaction in the classroom. This becomes reinforced as the implicit behavioral habitus of the teacher: I am in control when it is quiet. I always know exactly what my pupils are doing (because there is no particular degree of freedom in my teaching). If I have an overview of all activities, I am a good teacher. I don’t have to question the world any longer like my pupils do. I pass on knowledge of the world and don’t act from the point of view of a learner; that would detract from my authority as a teacher, if I didn’t always know the answer but had to ask and investigate together with the pupils. Please note: Teacher training has for a long time now shifted towards moderate constructivist teaching models (Bruner, 1997; Reich, 2008), however these only come to limited effect due to the tacit and powerful school cultures and their stage directives. The imaginary and symbolic elements of the kindergarten- and school-cultures convey the appearance of sheltered tranquility or hierarchical order and of the transmission of – allegedly – secure scholarly knowledge towards the parents, the school management, the teachers and lastly the children; this is done on the basis of a long tradition of not always conscious ideas and habitual knowledge, in defiance of what appear in the end to be only rhetoric-seeming efforts on the part of constructivism and the scientific training of the teachers-to-be. And those teachers who still develop an individual teaching culture have to deal with considerable acceptability problems. Such movements of the goalposts from learning to the performative presentation of existing ideas in kindergarten and school are, however, also the result of a “time-pressure thought-pattern” that has followed particularly in the wake of the PISA-research. Discussions about instructional early support and self-socialisation concepts have been reported in earlier research before PISA, having pointed out washing-out effects for strong intruction oriented, program-acquired learning and also hinting to sleeper-effects in children (later having better cognitive and social skills), that were raised with more child-centered approaches (Dollase, 2010; Grochla, 2008). Since the year 2001, at least in the German-speaking areas, numerous measures resulted from the public discussion around education after the publication of the results of the PISA-studies; these measures revolved around early education, even though the study was on a school-system regarding the performance of 15-year-old pupils. The German Conference of Ministers of Education and Cultural Affairs, for example, determined seven areas of action (Conference of Ministers of Education and Cultural Affairs [KMK], 2002), of which three apply explicitly to the preschool and primary school stages. In Switzerland a plan of action with five areas of action was also decided upon (EDK, 2003), whereby one explicitly takes “Preschool and Starting School” as its topic, whilst three others include the kindergarten phase: language promotion, language promotion for children and young people with unfavorable learning preconditions, after-school care options. In both countries the aim was to support children linguistically in the preschool phase, to enable them to start school earlier via a better interrelationship between kindergarten and school, as well as generally improving elementary and primary school education. On the one hand, this was positive due to an improvement in the training of elementary and primary phase teachers, even though more still needs to be done (Heinzel, 2009). On the other hand, the pressure to act resulted in numerous further training programs being presented which, although labeled as play-oriented, were designed more in line with primary school order and culture (e.g. the Würzburger training program for phonological consciousness according to Knuspert & Schneider, 2008, and the mathematics training program “Mengen, zählen, Zahlen” by Krajewski, Nieding & Schneider, 2007). Because these programs can really be time-consuming, free play time in the kindergarten is often lost, which is why we are asking here whether the end of playing time is near (viz. title). Thus, today the “natural” inertia of the kindergarten and school cultures appears to be under the pressure of the no longer questioned motto of “the earlier – the better”, which is further strengthened by neuro-metaphors such as the “closing windows” (Küls, n.d). Consequently, play is now often only justified in a learning mode when it is proven that one learns “more quickly” through play. Thus (pre-)school order is to some extent oriented in its temporal dimension by the PISA reception, whilst these processes are frequently not consciously perceived and reflected upon; for the professionals they are part of the sphere of the real, that which cannot itself be addressed or questioned (Hummrich, 2015). With every good intention, one often refers to the kindergarten in rhetoric as the “preparation for school”, whilst school is not seen to be a place of leisure, meditation (lat. “schola”) and education, but as a place of a certain scholarly order. In the heart of the kindergarten time, preparation for school can in this way become an end in itself. The autonomous nature of the kindergarten is still referred to here, but in essence it is all about the future and not about the value of autonomous play in the kindergarten, which in turn could well be meaningful for the school. Parallel to the increase in diagnostics and tests concerning the introduction of educational standards (EDK, 2011), as well as diverse support programmes, the discourse conveying this time pressure pattern of thinking has spread publicly, so teachers are being pressurized not only by their superiors and the test materials, but often also by the parents. The same applies to the structuring of time and lessons: The aim seems to be to become accustomed to the school lesson as a unit per se, irrespective of the research, play, in-depth processes of children which would and should result in their own time frames. The familiarization with school orders which takes place earlier and earlier, the “familiarization with instructions”, in practice unfortunately results in “familiarization with extrinsic motivation” in the sense of external regulation (Ryan & Deci, 2000). And this is exactly the opposite of what one intends: motivated, sustainable learning, which takes place precisely in play (Singer et al., 2006; Pellegrini, 2009; Hauser, 2013; Brooker et al., 2014). Although the autonomy theory of motivation (Ryan & Deci, 2000) shows that the relationship between intrinsic and extrinsic motivation is empirically well established, and this theory should be known to all teachers, school education still follows traditional patterns rather than constructively making use of this knowledge and thereby developing teaching further. Intrinsic motivation can be killed very efficiently with extrinsic motivation (ibid.). One could actually ask: How could one promote intrinsic motivation in children as a habit of play, thereby perpetuating their ability to become interested in something for its own sake and developing their educational ability – based on play in the kindergarten? In the primary school phase one could then build on this further, with feedback on the relevant activity itself, instead of a strongly emphasized external system of reward with grades. Children with a lot of experience in play succeed better at identifying with more distant and abstract goals and at overcoming obstacles with self-activated interest in the matter. Playful motivation has been proven to be a more sustainable manner of effective education than strongly externally regulated, extrinsic motivation (Ryan & Deci, 2000; Montie, Claxton & Lockhart, 2007). Instead however, habitually, and perhaps also unconsciously, discourse and school materials tend to approach matters the other way around: The question is then asked: How can we get the children used to following an external, extrinsic instruction with reward as soon as possible? What for? If one argued on the level of conscious decisions, this would lead to a cynical view: perhaps so that the school and the teachers don’t have to concern themselves too much with the interests of the children, but rather that the children get used, as quickly as possible, to the school’s culture as an end in itself. However, the unquestioned preparation metaphor and consequent time pressure drives us to lose sight of the ability of children for self-education – via learning through experience (e.g. Schäfer, 2011 & 2013; Militzer, Demandewitz & Solbach, 1999) – and also the centrality of co-construction in class interaction. And here one could query whether an implicit culture struggle about the culture of the kindergarten is taking place via the direct transfer of primary school structures onto the kindergarten. The separation of the two school cultures is supported through the opposing terminology of learning (serious work) and play (fun). By using play as a vehicle through the addition of a didactic framework and the “preparatory” adoption of school-oriented support programs, the primary school culture gains further acceptance in the kindergarten. The reason for the reservations made regarding play, which are frequently expressed with words such as “fun” or “frivolous”, could lie in the widespread understanding of the nature of play and work and their relationship to each other. Should one not pose Freinet’s question as to whether one “overlooks the power of argumentation and interaction, of adaptation and liberation in play and only sees the euphoric fun that is apparent” (Freinet & Boehncke, 1980, 80)? One overlooks that play and playing are degraded and reserved exclusively for childhood and recreation times. Even Dewey had established that play and work are not all that different, since both activities have to do with acting in and with the world, changing it and thereby changing oneself (Dewey, 1993). Perhaps the strict separation of play and work has to do with developments that have increasingly led to work forms that are imposed from outside and are seen as useless or unworthy (in Marxist terms: alienated work) (Marx, 1867; Freinet & Boehncke, 1980; Heimlich, 2015), which is why the term ‘play’ possibly stands as a realm of preserving freedom, of countering that. Thus Freinet (1980, 89) maintains: “One is convinced that work and play are radical and irreconcilable opposites. One believes that the work that one normally knows only in its tyrannical form is nothing for children.” Moreover, newer tendencies of flexibilisation and fluid job arrangements pervert the purpose of “self-determination” and “free” work (corresponding to the spirit of play), and in so doing change them into only the appearance of freedom, concealing the external control (Boltanski & Chiapello, 2003). The relationship between play and work is pushed more and more into the direction of alienation, when only imaginary betterment of the intrinsic motivation takes place. These social tendencies further misinterpretation and even the danger of misuse of the term ‘play’ in school and kindergarten: ‘play’ as a Trojan horse that is constantly packed with specific school-oriented demands and guidance from outside, demands directed towards the continuous and intended learning of very specific school contents and culture-techniques, ‘play’ that is thus removed from its essential nature even in kindergarten and is still free play by word only. At the same time, it is precisely the games of children that are the most fascinating, in which they create their own world and act out their ideas in flow, in which they negotiate outer “real-world” impulses all on their own. Freinet therefore demands “travail-jeu”, work with the nature of play, as well as “jeux-travaux”, games of a working nature that describe the transition from play to work in a constitutive manner and where the intrinsic nature of play is retained (Freinet & Boehncke, 1980). But: What does play “that should be taken seriously” look like? What kind of play should be promoted in kindergarten and school when it is not always about fun, but also about the desire to understand and (re-)construct the world? Which (play) materials are required? Could they also be such materials that are interesting for the children, but that make use of feasible adult activities that are adapted to the realm of the child? Rule games as well as role play in such a context can, besides fostering language, mathematics and abstract thinking, also make topics, roles and rules in certain areas of society accessible and open to play with/for children. Games with rules can be competitive and challenging and allow for the experience of a collective, the players being equals, at the same time. What does this all mean with regard to the pedagogical activity in the context of play and school ideally as a place of work and learning with the character of play? The long-term opposition of the terms ‘work’ and ‘play’ concurs with the acute shifts described in the discourses around PISA and early intervention, in the working world as well as in educational plans. Together they generate dynamics and connections in the partly self-formulated school cultures of kindergarten and primary school. In particular, the culture of the kindergarten in German-speaking Switzerland is currently in danger of developing unilaterally in the direction of primary school culture. This discussion is, however, not a simple, contradictory plea to “change everything” in school “to play”. And it also does not imply a decision in favour of a purely open teaching methodology. Open teaching methodology, like daily and weekly to-do-lists can be followed in a very rigid, uninviting way, with rewards being externally motivated, all of which is thus done in a rather “unplayful” manner. On the other hand, even in traditional and teacher-up-front-settings stimulating challenges, mental and physical movements can be initiated in the children with a sense for the research aspect of play (Weißhaupt et al., 2018, in print), and one can enable them to reconstruct the world from many perspectives through the medium of a playful as-if-attitude. A prerequisite for this would be that the teachers also develop a sense of play. These ideas also pertain to the “creative potential of the imaginary” (Hummrich, 2015, 73), which takes the developmental space of school into consideration. Thus, class settings would be conceivable both in kindergarten and in primary school, situationally and adequately arranging for children’s free activities and instructed activities, relating them and keeping a balance between them (Streit, Künzli & Hildebrandt, 2016). Thus, irrespective of concrete, different teaching settings, one can argue that ultimately it could be unimportant whether the activities of the children were at first glance labeled as “work” or “play”, but rather that “playfulness” were part of the children’s activities and learning. The traditional idea of the kindergarten as a cultural shelter, in opposition to the serious, or even dangerous world of grown-ups, of work and serious learning at school should then also be approached critically (Weißhaupt & Campana, 2014). Nevertheless, the consequence cannot be the advance building of a school habitus formation within the kindergarten as an adaptation to school work structures, thereby hurrying to replace play. On the contrary, possibilities could lie in the playful habitus which can emerge in kindergarten and its culture. That could be seen as a vital resource to build on and to be developed even further in primary and later school, pertaining to both children and teachers, thus consciously working and playing with the respective school cultures, instead of just acting them out. Angelone, D., Keller, F., & Moser, U. (2013). Entwicklung schulischer Leistungen während der obligatorischen Schulzeit. Zürich: Bildungsdirektion Kanton Zürich. Association of Swiss Kindergarten-Teachers – Verband Schweizerischer Kindergärtnerinnen (1990). Kindergarten – ein Ort für Kinder. Grundlagen für die pädagogische Arbeit im Kindergarten. Hölstein: Verlag KG-CH. Boltanski, L., & Chiapello, È. (2003). Der neue Geist des Kapitalismus. Konstanz: UVK. Breidenstein, G. (2006). Teilnahme am Unterricht: Ethnographische Studien zum Schülerjob. Wiesbaden: VS Verlag für Sozialwissenschaften. Brooker, E., Blaise, M., & Edwards, S. (2014). Sage Handbook of Play and Learning in Early Childhood. Thousand Oaks, CA: Sage Publication Inc.
Bruner, J. (1997). The Culture of Education (2. Ed.). Cambridge, Massachusetts: Harvard University Press. Bülow, K. von (2011). Anschlussfähigkeit von Kindergarten und Grundschule. Rekonstruktion von subjektiven Bildungstheorien von Erzieherinnen und Lehrerinnen. Bad Heilbrunn: Klinkhardt. Chanson, A. (2004). Methoden der Kindergartenpraxis. Handbuch. Bern: hep. Collins, A. (1988): Cognitive Apprenticeship and Instructional Technology. Cambridge, Massachusetts: University of Illinois. De Haan, A., Elbers, E., Hoofs, H., & Leseman, P. (2013). Targeted versus mixed preschool and kindergartners: effects of classroom composition and teacher-managed activities on disadvantaged children’s emergent academic skills. 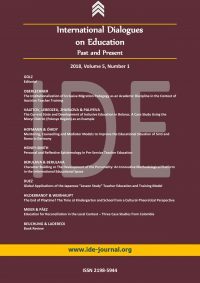 School Effectiveness and School Improvement: An International Journal of Research, Policy, and Practice, 24, pp. 177-194. D-EDK – Deutschschweizer Erziehungsdirektoren-Konferenz (2014). Lehrplan 21. URL: http://v-ef.lehrplan.ch/index.php?code=e|200|5 (retrieved: 2018, April 19). Dewey, J. (1993). Demokratie und Erziehung. Eine Einleitung in die philosophische Pädagogik. Weinheim und Basel: Beltz. EDK – Schweizerische Konferenz der kantonalen Erziehungsdirektoren (2003). Aktionsplan «PISA 2000»-Folgemassnahmen. URL: http://www.edudoc.ch/static/web/arbeiten/pisa2000_aktplan_d.pdf (retrieved: 2017, June 12). EDK – Schweizerische Konferenz der kantonalen Erziehungsdirektoren (2011). Nationale Bildungsziele. URL: http://www.edk.ch/dyn/12930.php (retrieved: 2017, September 11). Freinet, C., & Boehncke, H. (1980). Pädagogische Texte: Mit Beispielen aus der praktischen Arbeit nach Freinet. Reinbek b.H. : Rowohlt Taschenbuch. Fröbel, F. (2017/1826). Friedrich Fröbel’s Menschen-Erziehung, Erziehungs-Unterrichts-und Lehrkunst. London: Forgotten Books. Fthenakis, W. E. (2008). Bildung von Anfang an: Bildungskonzepte für Kinder unter sechs Jahren aus internationaler und nationaler Perspektive. M. Hoppe & A. Schack (Eds. ), Rohstoff Bildung: Lebenslang lernen. Wiesbadener Gespräche zur Sozialpolitik. Heidelberg: Dr. Curt Haefner Verlag, pp 135-166. Grochla, N. (2008). Qualität und Bildung: Eine Analyse des wissenschaftlichen Diskurses in der Frühpädagogik. Berlin: LIT. Hauser, B. (2013). Spielen: Frühes Lernen in Familie, Krippe und Kindergarten. Stuttgart: Kohlhammer. Heimlich, U. (2015). Einführung in die Spielpädagogik (3. Ed.). Bad Heilbrunn: Klinkhardt. Heinzel, F. (2009). Gleichwertige universitäre Bildung für den Elementar-, Primar-und Sekundarbereich in Deutschland. D. Bosse & P. Posch (Eds. ), Schule 2020 aus Expertensicht. Wiesbaden: VS Verlag für Sozialwissenschaften, pp. 256-271. Helsper, W. (2008). Schulkulturen – die Schule als symbolische Sinnordnung. Zeitschrift für Pädagogik, 54(1), pp. 63–80. Hildebrandt, E. & Weißhaupt, M. (2012). Werkstatt erarbeiten – Welt erspielen. Zeitschrift für Hochschulentwicklung, 7(3), pp. 74–83. URL: http://www.zfhe.at/index.php/zfhe/article/view/441 (retrieved: 2017, October 5). Hildebrandt, E., Nieswandt, M., Radtke, M., Schneider, R. & Wildt, J. (2014). Werkstätten als Raum für ,,Forschendes Lernen in der Hochschulbildung“. E. Hildebrandt, M. Peschel & M. Weißhaupt (Eds. ), Lernen zwischen freiem und instruiertem Tätigsein. Bad Heilbrunn: Klinkhardt Verlag, pp. 80-99. Hummrich, M. (2015). Die fragmentierte Ordnung. Das Imaginäre, das Symbolische, das Reale und die Schulkultur. J. Böhme, M. Hummrich & R.-T. Kramer (Eds. ), Schulkultur. Theoriebildung im Diskurs. Wiesbaden: Springer, pp. 71-94. Jakobson, R., & Halle, M. (1956/2010). Fundamentals of Language. Berlin: Walter de Gruyter. Jäger, M. (2007). Vom Familienkind zum Schulkind. Die Grundschulzeitschrift, 209, pp. 10-11. Jäger, M., Biffi, C., & Halfhide, T. (2006). Schlussbericht. «Grundstufe als Zusammenführung zweier Kulturen. Teil 1: Eine Ethnographie des Kindergartens». Zürich: Pädagogische Hochschule Zürich, Institut Forschung und Entwicklung. KMK – Kultusministerkonferenz (2002). PISA 2000 – Zentrale Handlungsfelder. Zusammenfassende Darstellung der laufenden und geplanten Massnahmen in den Ländern (2002, October 7). URL: https://www.kmk.org/fileadmin/Dateien/veroeffentlichungen_beschluesse/2002/2002_10_07-Pisa-2000-Zentrale-Handlungsfelder.pdf (retrieved: 2017, May 10). Krajewski, K., Nieding, G., & Schneider, W. (2007). Mengen, zählen, Zahlen (MZZ): Die Welt der Mathematik verstehen. Koffer mit Fördermaterialien und Handreichungen. Berlin: Cornelsen. Küls, H. (n.d.). Gehirnforschung, Lernen und Spracherwerb. URL: http://www.kindergartenpaedagogik.de/1024.html (retrieved: 2017, September 20). Küspert, P., & Schneider, W. (2008). Hören, lauschen, lernen – Anleitung und Arbeitsmaterial. Sprachspiele für Kinder im Vorschulalter – Würzburger Trainingsprogramm zur Vorbereitung auf den Erwerb der Schriftsprache (6. Ed.). Göttingen: Vandenhoeck & Ruprecht. Marx, K. (2016/1867). Das Kapital (Vollständige Gesamtausgabe): 3 Bände im Schuber. Hamburg: Nikol. Militzer, R., Demandewitz, H. & Solbach, R. (1999). Tausend Situationen und mehr. Die Tageseinrichtung – ein Lebens- und Erfahrungsraum für Kinder. Münster: Sozialpädagogisches Institut NRW – Votum Verlag. Montie, J. E., Claxton, J., & Lockhart, S. D. (2007). A multinational study supports child-initiated learning. Using the findings in your classroom. Young Children, 62(6), pp. 22-26. Pellegrini, A.D. (2009). The Role of Play in Human Development. New York: Oxford University Press. Proske, M. (2009). Das soziale Gedächtnis des Unterrichts: Eine Antwort auf das Wirkungsproblem der Erziehung? Zeitschrift für Pädagogik 55 (2009) 5, pp. 796-814. Reich, K. (2008). Konstruktivistische Didaktik: Lehr- und Studienbuch mit Methodenpool. Weinheim: Beltz. Röhner, C. (2009). Kinder zwischen Gleichaltrigenkultur und schulischer Ordnung oder: Verpasste Chancen im Übergang vom Elementar- zum Primarbereich. H. de Boer & H. Deckert-Peaceman (Eds. ), Kinder in der Schule. Zwischen Gleichaltrigenkultur und schulischer Ordnung. Wiesbaden: VS Verlag für Sozialwissenschaften, pp. 51-70. Rossbach, H.-G. (2004). Kognitiv anregende Lernumwelten im Kindergarten. Zeitschrift für Erziehungswissenschaft, 7(3), pp. 9-24. Ryan, R. M., & Deci, E. L. (2000). Self-determination theory and the facilitation of intrinsic motivation, social development, and well-being. American psychologist, 55(1), pp. 68-88. Schäfer, G. E. (2011). Was ist frühkindliche Bildung? Weinheim/Basel: Beltz. Schäfer, G. E. (2013). Der Bildungsbegriff in der Pädagogik der frühen Kindheit (3. Ed.). L. Fried & S. Roux (Eds. ), Handbuch: Pädagogik der frühen Kindheit. Berlin: Cornelsen Schulverlage GmbH, pp. 33-44. Singer, D.G., Golinkoff, R.M. & Hirsh-Pasek, K. (2006). Play = Learning: How Play Motivates and Enhances Children’s Cognitive and Social-Emotional Growth. Oxford: Oxford University Press. Stamm, M. (2014). Frühförderung als Kinderspiel: Ein Plädoyer für das Recht der Kinder auf das freie Spiel. Bern: Universtität Bern. URL: http://margritstamm.ch/dokumente/dossiers/232-fruehfoerderung-als-kinderspiel-2014/file.html (retrieved: 2018, April 20). Streit, C., Künzli, C., & Hildebrandt, E. (2016). Initiating the learning processes at the preschool and lower primary level: Challenges and possibilities. In South African Journal of Childhood Education 5(3), pp. 7. URL: https://sajce.co.za/index.php/sajce/article/view/358 (retrieved: 2018, April 19). Thies, C. (2016). Was ist Rousseauismus? Interdisziplinäre Anthropologie, 3, pp. 141-164. URL: https://link.springer.com/chapter/10.1007/978-3-658-10978-3_13 (retrieved: 2018, April 20). Walter-Laager, C. & Fasseing Heim, K. (2002). Kindergarten. Grundlagen aktueller Kindergartendidaktik. Winterthur: ProKiga-Lehrmitelverlag. Weißhaupt, M., & Campana, S. (2014). Spielbewusstsein und Bildung beim sozialen Spiel. E. Hildebrandt, M. Peschel & M. Weißhaupt (Eds. ), Lernen zwischen freiem und instruiertem Tätigsein. Bad Heilbrunn: Julius Klinkhardt, pp. 43-66. Weißhaupt, M., Hildebrandt, E., Hummel, M., Müller-Naendrup, B., Panitz, K. & Schneider, R. (2018). Perspektiven auf das Forschen in Lernwerkstätten. Peschel, M. & Kelkel, M. (Eds.). Fachlichkeit in Lernwerkstätten – Kind und Sache in Lernwerkstätten. Bad Heilbrunn: Klinkhardt, pp. 187-212. Zimpel, A. F. (2011). Lasst unsere Kinder spielen! Der Schlüssel zum Erfolg. Göttingen: Vandenhoeck & Ruprecht.